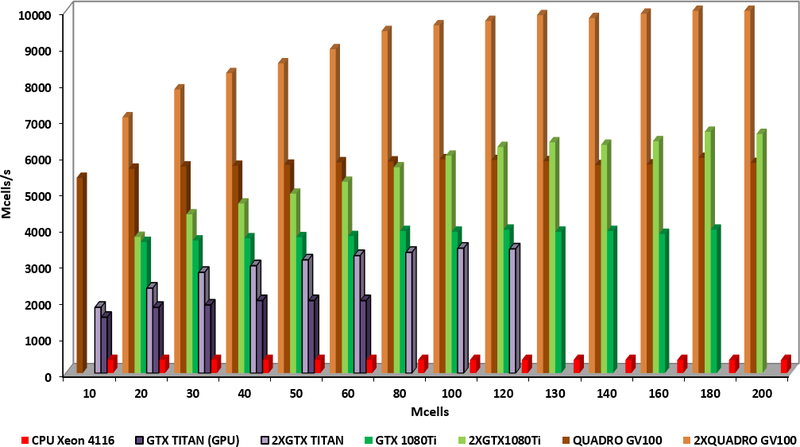 QW-GPUSim is a very fast version of QW-Simulator designated for massive parallel computing hardware. 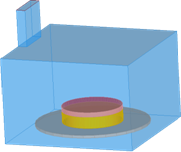 It incorporates parts of QW-Simulator code re-written by QWED in OpenCL. 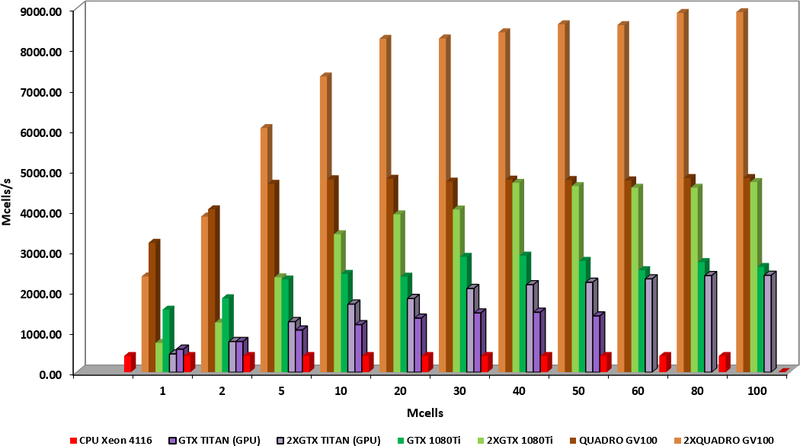 This strategy stabilises QW-GPUSim on the very dynamic GPU/CPU hardware market. 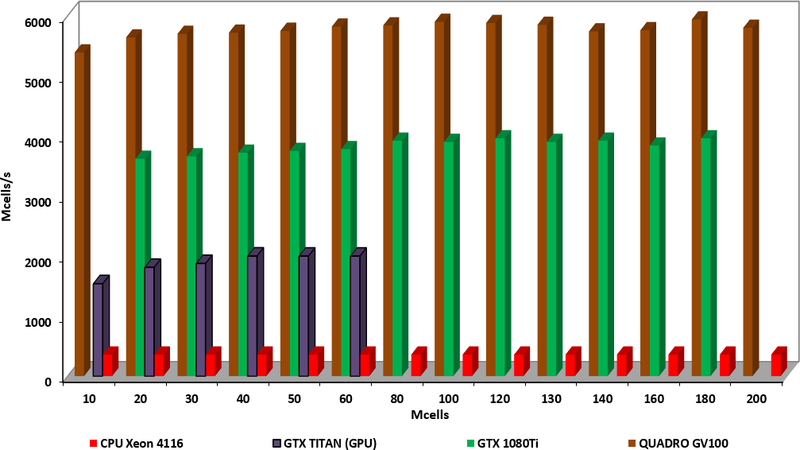 QW-GPUSim is currently optimised for application on modern PC graphic cards of a massively parallel architecture and significantly reduces the simulation time with the speedup of 14 for 3D applications and 28 for V2D applications (for NVidia GTX TITAN graphic card). QW-GPUSim is available for 64-bit version of QW-Simulator and is included in QuickWave Professional package. SpeedUp of the GPU computation of a two-reflector Cassegrain antenna model (V2D example) compared to QW-OMP version on Xeon 4116. 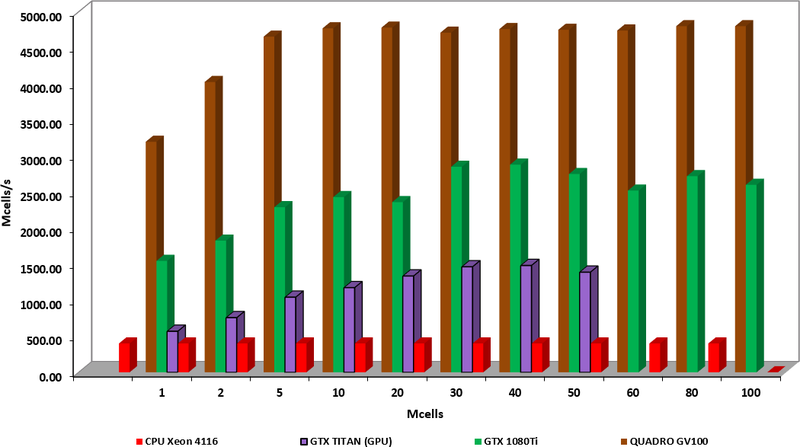 SpeedUp of the GPU computation of a beefburger placed in a cavity oven (3D example) compared to QW-OMP version on Xeon 4116. Graphic cards (GPU) while offering great performance have one important issue - very limited memory space. This becomes crucial in big projects, where their speed performance cannot be used and where it is the most desired. In such situations the CPU implementation of QW-Simulator is used, what substantially decreases the simulation speed. To circumvent this limitation we introduce QW-MultiGPU Simulator (QW-MultiGPUSim) that enables running single simulation on multiple GPU devices. QW-MultiGPUSim performs spatial decomposition and divides analysed circuit into subregions, which are simulated on separate GPU cards. Using multiple GPU cards of a massively parallel architecture extends the available memory and significantly reduces the simulation time. QW-MultiGPUSim is available for 64-bit version of QW-Simulator as an optional module. SpeedUp of the GPU and MultiGPU computation of a two-reflector Cassegrain antenna model (V2D example) compared to QW-OMP version on Xeon 4116. SpeedUp of the GPU and MultiGPU simulation scenario (project divided along Y direction into two symmetrical subregions) computation of a beefburger placed in a cavity oven (3D example) compared to QW-OMP version on Xeon 4116. Quadro GV100 cards have been provided by Servodata Elektronik Sp. z o.o., Poland.